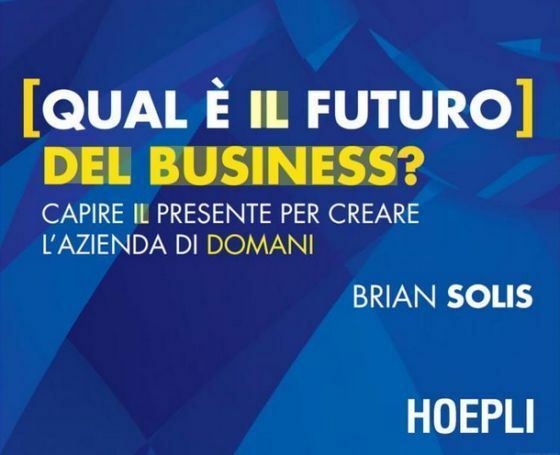 During last days I interviewed Brian Solis now that an Italian translation of his last book is finally available. What would You suggest to a family medium business like hundreds or thousands in Italy? How could they embrace this positive change? Where should they start from? Disruptive technology is just that…it’s disruptive. Every so often, something new comes around and completely upsets the balance. Now, innovation is part of our society and it’s only accelerating. The key to success is to simply accept that this is the end of business as usual. The way that things were done only evolve to accommodate the expectations and preferences of evolved customers and employees. And, that’s where we begin. We need to understand what’s changing so that we can learn and adapt. This isn’t anything to fear nor is it something that we should discount. But ignoring how technology is affecting customer or employee behavior isn’t an option. In the end, that’s what this is about…behavior. What’s different about your connected customers over your traditional customers? How are they using technology to make decisions? What do they search for? What do they ask? Where do they go? Most importantly…what comes back in their search or what answers are given to their common questions? Answering these questions makes change approachable because you can see and feel what’s different. Any impassioned business professional will realize that technology doesn’t present challenges or obstacles. The word change here is similar to saying improvement…improvement to chase new opportunities and grow your business. Is this a key topic for consumer goods and big companies or it could interesting to leverage for SMB too? How could You manage it with only a few resources to spend on that? Digital influencers are those experts and authorities in any market that customers and prospects find when in search of information, direction, or validation. This is a bit different than advocates, which may or may not be customers, but share a passion for the company’s products, services or purpose. Regardless of the size of the business, it’s imperative for to learn who influences and advocates for your business and your competition. There are of course many services such as eCairn and Traackr that make it easy to identify who they are, what they talk about and where. But, this is a future that shares much with the past…relationships are everything. Getting to know them is just the beginning. Recognizing their work. Engaging them to learn more before you need something is also key. In a connected world where people trust others like them, finding influential people in networks where customers and prospects engage with one another will only help you learn more about expectations, challenges, and opportunities. More so, you’ll learn about the people whom others trust and how to build a relationship with them. Taking the time to learn and engage helps you expand your reach from one-to-one to one-to-one-to-many. Word of mouth is more powerful than ever before. I understand that time is limited, but you get out of relationships, whether in real life or online, what you put into them. What about B2B companies? I believe we should address this topic from a P2P (people to people) point of view, what is Your opinion? One of the first things I often hear from b2b marketers and strategists is that all examples of new media are inherently b2c. They then venture to ask how new technologies apply to their world. It is for this reason that I begin referring b2b and b2c as simply p2p, people to people. That’s what this is about…people. The question is how are your connected customers different than your traditional customers? Decision-making takes place online of course. Connected customers use different networks and tools to discover, engage, and share. This really is about journey mapping to uncover the new touch points, technologies and the behaviors that shift as a result. While the networks and apps may change, your customer’s journey is increasingly shifting from older touch points to new social and mobile communities. It’s true for everything. You used a cool format, very visual, colorful and straight to the point. What’s the story behind the book? The book is a testament to the fact that technology is changing people’s behavior and we have to change along with it. I recently stumbled across a statistic that shows teenagers can only focus for six minutes while doing homework until they have to reach for a connected device to plug-in. How can I help businesses change if I can’t change myself? I’ve written many books but this is the first where I stepped back to approach the opportunity differently. Rather than publish a book the same old way with the same paper, shape, and font, I decided to study how connected consumers or Generation-C (connected) as I refer to them, read and share content online and on devices. What I learned is that multitasking is part of the experience now and that information can be presented on paper in a way that’s familiar, and appreciated, on digital devices. Essentially what I set out to answer is if we know consumer behavior is changing what would the ideal book look like to be accepted and valued in today’s digital lifestyle. When you start with a different question you get a different result. And, that’s the point. This is a time for innovation and reinvention. I partnered with my friends at Mekanism to create what is a digital UI in printed book form. We call it an analog app. It’s rich with visuals, infographics, and also cartoons that summarize each chapter drawn by my dear friend Hugh MacLeod (@gapingvoid). Also, each chapter includes a navigation bar to help readers easily jump from section to section. It’s also important that I share that as a write, I had to change how I write. Here, my sentences are presented in burst formats, similar to Tweets, to help connect with readers in a more dynamic way. It also makes the content shareable. Nothing is simplified however. It’s still a deep book. It’s just modernized to reflect how we interact with information now as a result of our connected lifestyle. I met Your partner Charlene Li in Rome a couple of years ago and she told me even USA companies have not fully embraced social technology inside their business. Are we still at the beginning of a new era? Why millions of people are on Facebook, LinkedIn, Twitter and online but companies still invest not enough on digital? Do we have a cultural problem or a generational one? The problem is purely philosophical. Social is part technology but it is what social unlocks and also empowers that is truly transformative. It’s a great equalizer. Social flattens markets and connects people to other people. As we become more connected we become more informed. With information comes power and empowerment. And with empowerment, consumers become more demanding. It’s not just generational however. This is about everyone who lives a connected lifestyle. Sure Millennials are digital natives. But everyday people who are over 40 who use a smartphone or a tablet or social networks and apps start to exhibit Millennial-like behaviors. Businesses must not only embrace the technology that their customers use they must understand how technology is affecting discovery, perception, decisions, and loyalty. Many companies think that the answer is digital. But digital is just a means to reach people. It’s how we change and evolve our philosophy to adapt to new expectations, behaviors and values to not just reach to markets, but to lead them in meaningful ways. That’s the future of business. This is a time for leaders…not managers.